The guide on painting is handled on the "Paint me down" page but handling an airbrush can be demanding so I thought I'd write it's own page. The airbrush will probably be the most expensive tool you'll have for your plastic model making. The airbrushes themselves costs in the range of €100-150 and then you'll need a compressor which is another €100-€200. If you're concerned about the breathing environment an airbrush booth will set you back another €100-€200. Is it worth it? Well if you can afford it it definitely is. 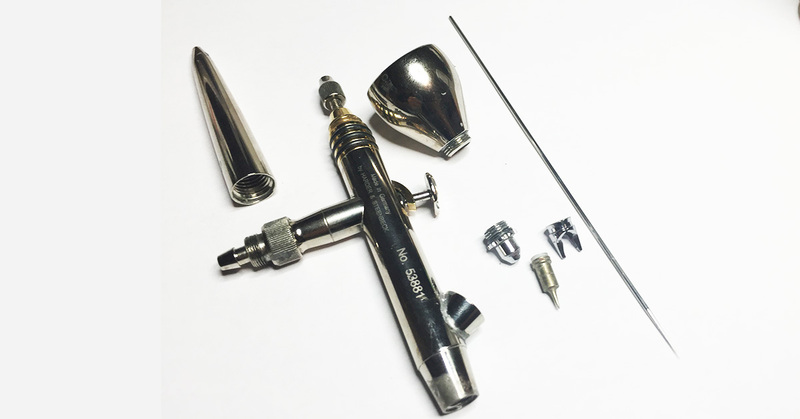 There's different types of airbrushes and you better understand what it is your buying. First of all there is single-action and double-action. The single-action only controls how much air is let through the airbrush but not the volume of paint. If you need to adjust the amount of paint there is usually a screw at the rear of the airbrush that you have to stop and adjust. 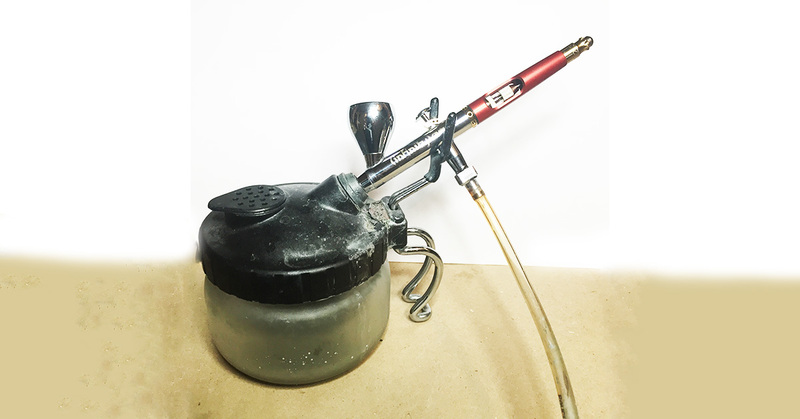 The single-action airbrushes are easier to learn and maintain. The double-action airbrushes have a single control that manages both the airflow and the paint volume. You press down to regulate the air and move back and forth to regulate the paint. This takes a little bit more practice but gives you a lot more control while painting. Personally I prefer the double-action. Then we have gravity or siphon feed. The gravity feed have the paint cup at the top of the airbrush and uses gravity to feed the brush with paint. The siphon feed have a cannister or bottle under the brush from where the paint is sucked up into the brush. The gravity feed needs less air pressure to operate but usually holds less paint at the time. Personally I prefer the gravity feed as I find it simpler to manage. 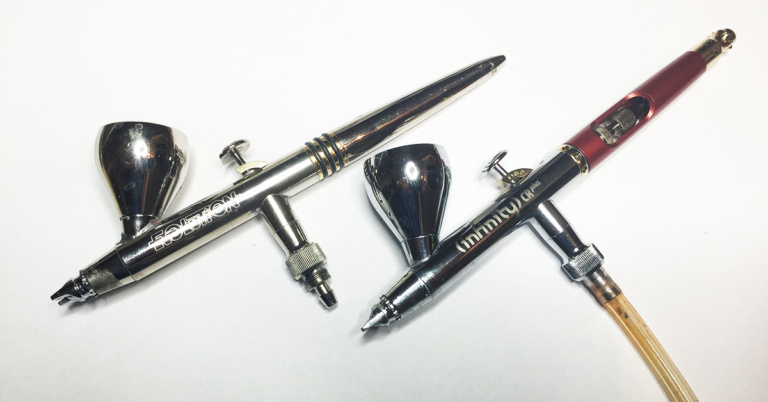 Most airbrushes have interchangeable needles and nozzles of different thickness. The thicker the more paint and, theoretically, broader area covered. The drawback with really thin nozzles, specially when using acrylic colours, is that they clog more easily. 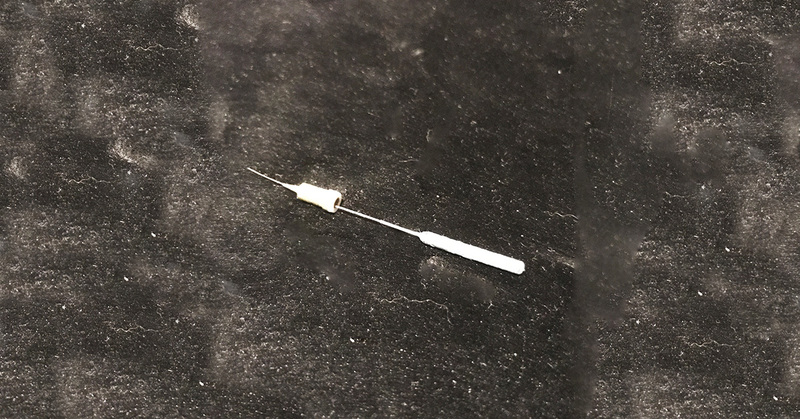 I used to switch between 0.15 and 0.4 needles and nozzles but found that it was a hassle to keep track of which needle belonged to which nozzle. Today I've switched to a 0.2 set up and use it for everything. This is of course easier as I have a double-action airbrush and therefore direct control of the paint amount. 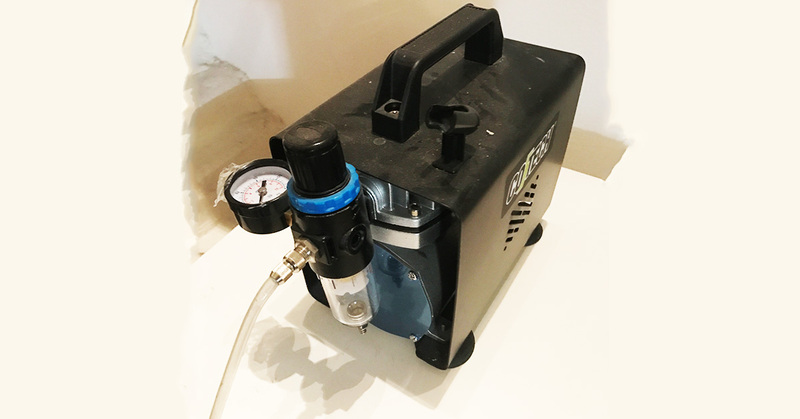 The compressor generates the needed air pressure. There is alternatives as spray cannisters with compressed air but if nothing else it's a hassle to always make sure that you have enough pressure to finish your kit. Make sure that you check how much pressure the airbrush manufacturer recommends. Too much pressure and you risk over spray and also that the paint drops dries on the way to the target and forms a grainy surface. Too little pressure risks bigger atomized droplets with a coarser spray texture and also the paint will be more prone to clog the airbrush. When you understand this you can also see why a compressor where you can regulate the pressure is a good thing. The pressure is given in bar or psi (psi mostly in the US) and usually you'd like to keep it between 1.5 - 3 bars (14.5 - 43.5 psi). When using a airbrush it's important that the paint have the right viscosity. A thick paint will quickly clog the airbrush. If you're using enamel paint you usually need to thin it out with thinner. Likewise with acrylic paint but with acrylic paint you only need water to dilute (well, distilled water if you want to be meticulous). 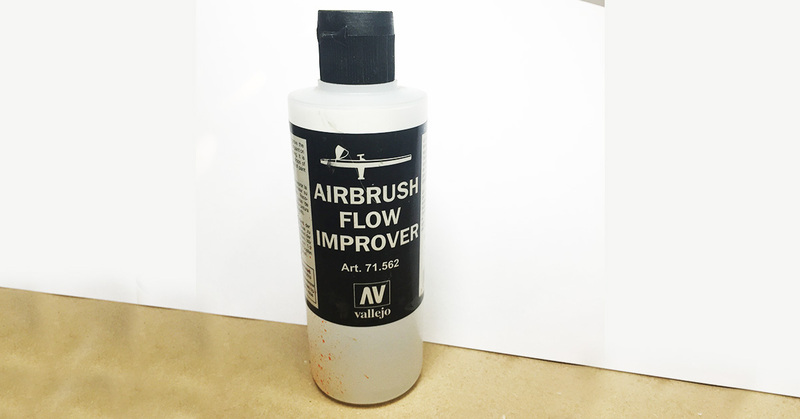 There is acrylic paint designed specially for airbrushing like Vallejo's Model Air or Mig Acrylic Color, but even they sometime needs a few drops of airbrush flow improver or water. Techniques for painting with airbrushes varies and I suggest you look around on the net for guides if you want to learn. Here I'll just say that if you want a good result you have to be prepared to put the paint on in several layers. Put the paint on in thin layers with even strokes over the area. Repeat until you have the desired effect. The airbrush is a tool that needs constant love and care. The amount of bad things that will happen if you don't respect this has made many people give up. I use two levels of maintenance. 1) After every colour I empty the airbrush, wipe the cup with a tissue and, as I use acrylic colours, fill the cup with plain water. Using a larger brush I whisk around in the cup to dissolve any paint residue. Then I place the airbrush in a cleaning pot (see picture) and spray out the cleaning liquid in the pot. Then again fill with water but this time, when spraying, I but a cloth or tissue to the nozzle so the air bubbles back into the cup a couple of times. This helps to clean out the nozzle. Some times, just to be sure, I finish with a little bit of Airbrush Cleaner in the cup and spray it out. Then the airbrush should be ready for the next use. 2) But the process above does not thoroughly clean out the airbrush so from time to time you have to disassemble it and give it a good cleaning. Remove the nozzle and loosen the needle and push it out forwards to avoid dragging paint into the interior of the airbrush. Place the nozzle in airbrush cleaner and start to thoroughly clean the airbrush with cotton buds/topz drenched in cleaner or alcohol. 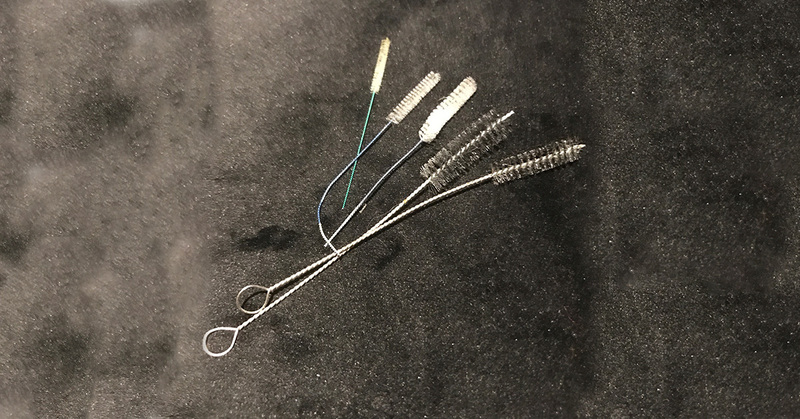 Use a pipe cleaner or small cleaning brushes to clean out the pipe where the needle goes. Take the nozzle and use the needle or even better a special cleaning needle to remove paint residue from the inside. Put everything together again. I use this method as soon as I'm experiencing any trouble or if I'm not going to use the airbrush for some time. After using a nozzle a long time there can be some residue that is harder to clean away. Then it's good to have a ultrasonic cleaner to really clean the nozzle and needle. There is relatively cheap ones for cleaning jewellery and tattoo equipment available.